Vegetables and beans and rice can’t talk Mama. They can’t even think. Even though vegetables are alive they’re not like us because they don’t have hearts. Except for artichokes. Artichokes have hearts. So just as I am about to give up – throw my hands up in the air – walk away from it all – declare that my cooking days are done – that one song, that one beat, that one sound, that one voice echoes through the speakers. And in an instant, inspiration fills the house, my knife comfortably cozies up to my hand ready to begin our duet. And before the song has ended I have the night’s meal figured out. What I listen to while I cook is much more critical than what we listen to while we eat. It can make all the difference between an inspired meal and a tedious job that just needs to get done. My musical tastes and the songs that inspire me in the kitchen vary from day to day. But there is one sound that is a constant companion in our house. On at all times – providing the soundtrack to our daily lives. This. NPR is the sound that links us to the outside world, challenging our minds, provoking debate, but more importantly comforting and grounding us in our daily routine. 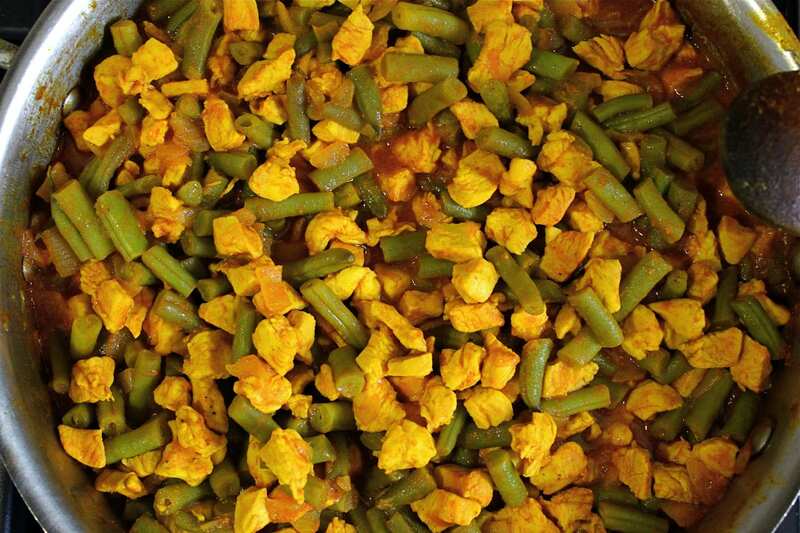 The meal equivalent of this comforting staple in our house is Loobia Polo – green beans and rice. 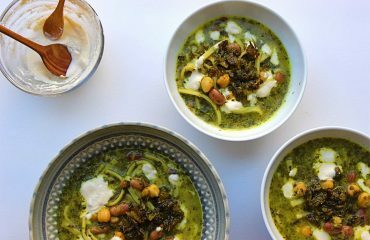 Loobia Polo is my husband Drew’s most loved Persian meal. In fact, it could very well be his all-time favorite dish for dinner. It’s the one meal that even the pickiest of little eaters will dig in for seconds. It also makes a great thermos lunch for school the next day. Where NPR challenges us, gets us thinking, and fills us with sensational-free information – Loobia Polo comforts and soothes our souls. Every morning we wake and without a second thought put the kettle on and turn on the radio. And every Friday we celebrate having made it through another week with an exultant Friday Night Loobia Polo. 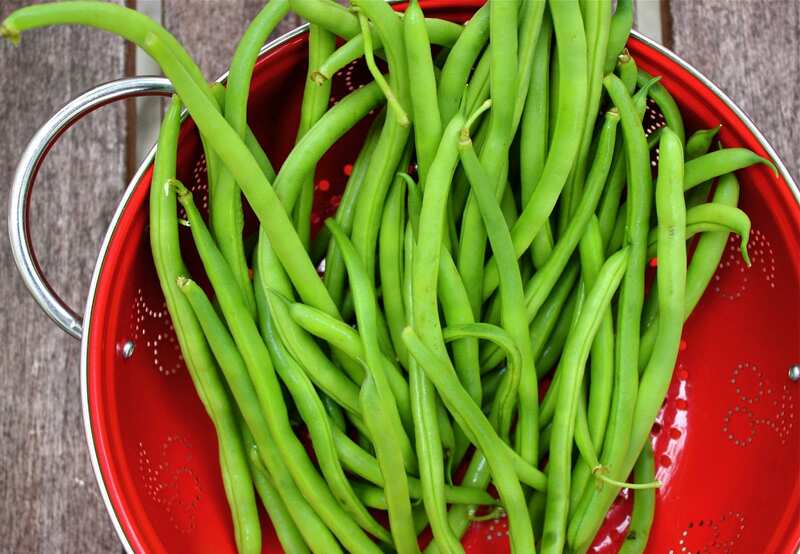 Green beans are bursting at the farmers market and in our farm box right now. 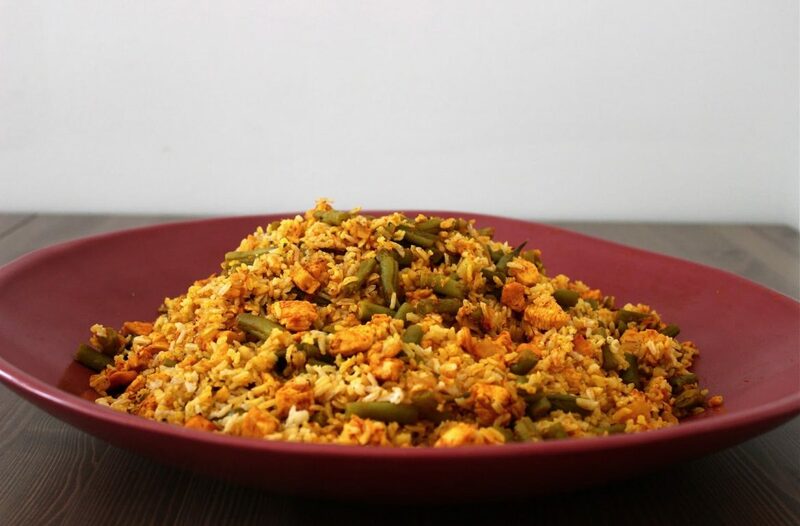 The green bean mixture is quite easy and quick to prepare. 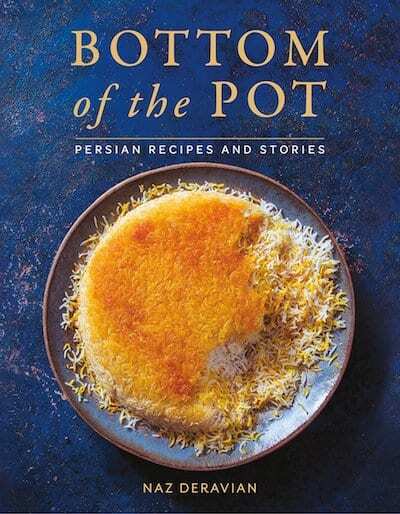 The beans delicately soak up the aromatic and flavorful blend of the spices: saffron, turmeric, cinnamon – with the addition of tomato paste to create a sauce, and of course freshly squeezed lemon juice for that slightly tangy sour taste that dictates most Persian stews. When the end of the recipe asks that you adjust the seasoning to taste, this not only applies to the addition of salt and pepper but also to extra lemon juice if necessary. What you also want to keep in mind is to maintain the texture of the green beans. No mushy, out of the can style, green bean mess please. The green bean mixture is traditionally served mixed in with rice – I typically use brown basmati rice, but you can serve it along side white rice or any grain you prefer. The mixture can also be prepared ahead of time. Fridays happen to be one of our busiest days, so I like to split up the preparation process. I might prep the beans and chicken (prepping is the most time-consuming part) the night before, so all I would have to do the day of is cook the mixture and put on a pot of rice. Or if I can find the time I will cook the mixture a few days in advance. The green bean mixture can be made 2 days in advance and stored in the fridge. It can also be made ahead of time and stored in the freezer for up to 3 months. And if there is one dish that begs to be accompanied by mast o khiar, it’s Loobia Polo. 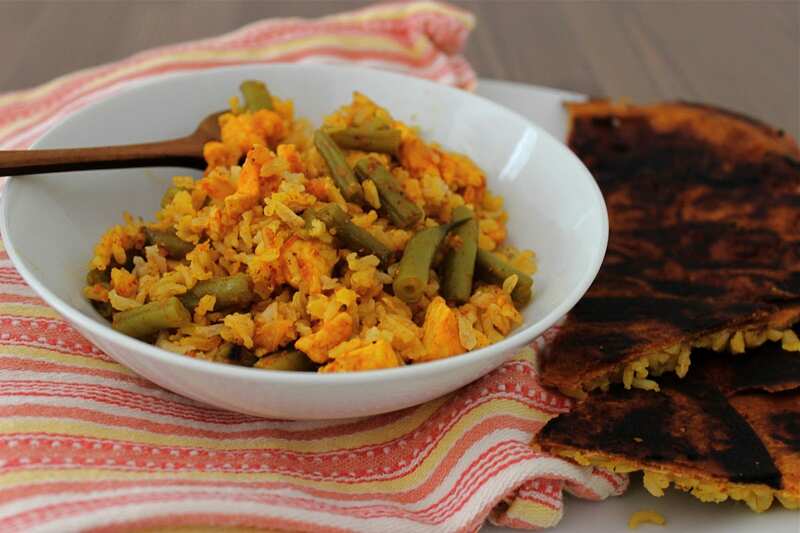 The preparation of the bread tahdig is very similar to that of a rice tahdig. I used bread here for variety and because the girls happened to ask for it. Some days Luna prefers bread tahdig and Soleil prefers rice tahdig. The challenge is to get them to agree to the same kind of tahdig on the same day. 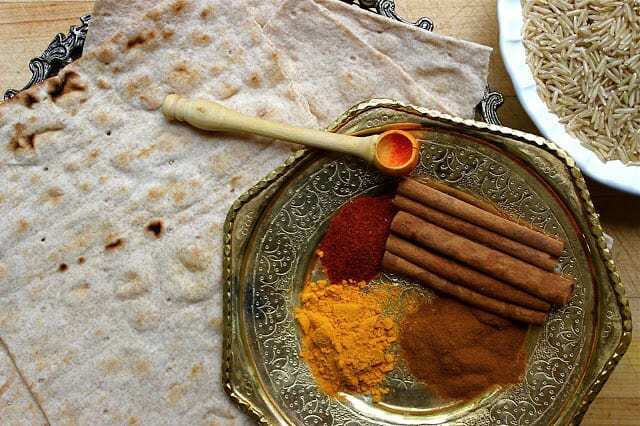 Typically we use lavash bread – which is like a thin Middle Eastern style flat bread. On this particular day I used a whole wheat lavash from Trader Joe’s. I simply tear fairly large pieces and place them on the bottom of the pot. Then I patch up any open spaces with smaller pieces. Make sure the sides of your pot are well-greased to avoid the bread sticking to the sides of the pot. Bread tahdig can burn very quickly so really keep a nose on this one and use a heat diffuser for the rice steaming part to ensure no burning of the bread. I use an old toaster oven metal rack insert as my heat diffuser. 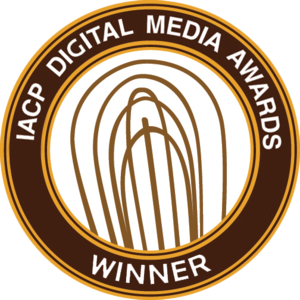 So thank you Morning Edition’s Steve Inskeep, Renne Montagne, and David Greene for accompanying us through another school year of hurried and harried breakfasts and lunches. Thank you Weekend Edition’s Scott Simon, Rachel Martin and puzzle master Will Shortz for your constant reminders that we are now parents, and that weekends and sleeping in are no longer synonymous. And thank you to All Things Considered’s Robert Siegel, Mellisa Block and Audie Cornish for being there with us through many weeknights of dinner prep – culminating with a satisfying Friday Night Loobia Polo. And of course, my husband’s favorite: Lakshmi Singh. 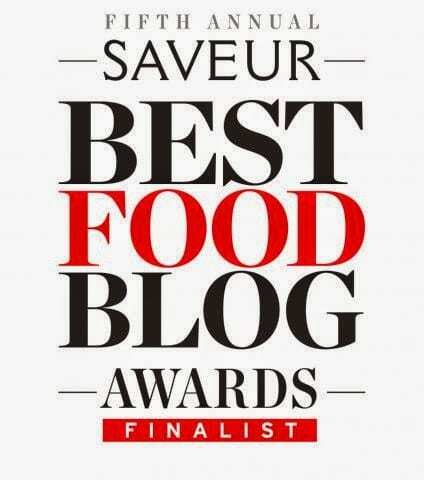 Please do share – what do you like cook to? Is there a particular tune that gets you going in the kitchen? 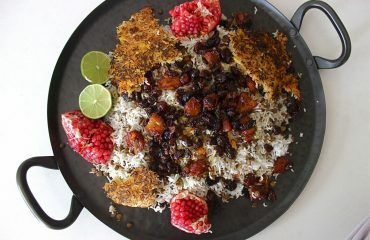 If you don’t want to make the tahdig you can simply make the mixture and serve it with any kind of rice or grain you like. It is tastiest mixed in with your grain of choice. The recipe below uses brown basmati rice. If you would like to use white basmati rice keep in mind that white rice takes a shorter time to cook al dente at the par-boil stage. 8-10 minutes for white rice, 20-25 minutes for brown rice. 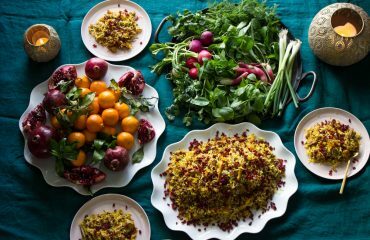 For a more detailed guide to cooking Persian rice please see this post. * I used bionaturae tomato paste. 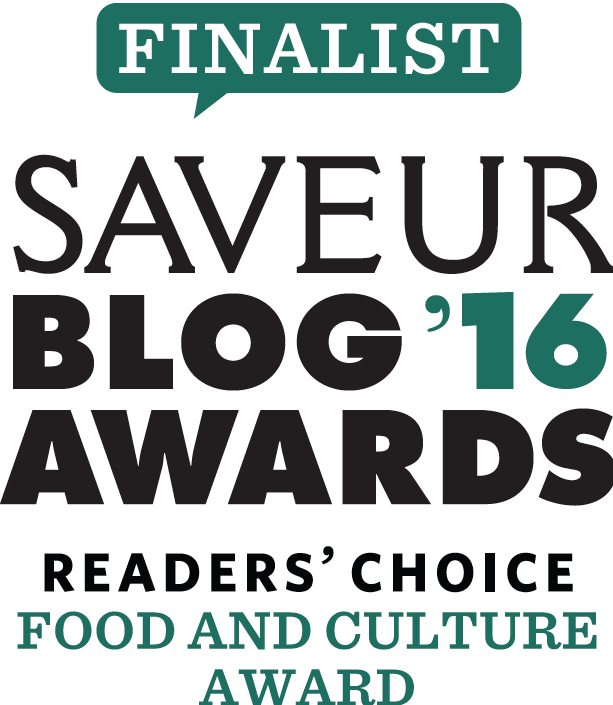 I find it is slightly less concentrated in flavor than other tomato pastes. So I ended up using 4 tablespoons of paste. You might want to start with 2 tablespoons and add and adjust amount to taste. Wash and soak brown basmati rice and 2 tablespoons salt for 1 hour. Heat 3 tablespoons olive oil in a large sauce pan over medium heat. Add onion and a pinch of salt and saute for 5 minutes, stirring occasionally until onion softens. Add green beans and 1/2 teaspoon salt. Saute for 5-8 minutes, stirring occasionally until green beans soften slightly. Take care not to burn green beans. Turn down heat if necessary. Add chicken, turmeric, cinnamon, 1 teaspoon salt, 1/4 teaspoon pepper. Saute for 3-5 minutes. Add saffron water, tomato paste water, and lemon juice. Stir to combine. Turn heat down to medium low and simmer uncovered for 20 minutes, stirring occassionally until chicken has cooked through and green beans have softened, but not mushy. Adjust seasoning and add more lemon juice if necessary. Meanwhile, bring 10 cups of water and 3 tablespoons of salt to a boil in a large non-stick pot. Drain soaked rice and add rice to pot. Bring back up to boil. Scoop off any foam that rise to the top. Start testing your rice at 20 minutes. Once rice is al dente (takes 20-25 minutes) drain in a colander and quickly rinse under cold water. Allow rice to completely drain off any excess water. Melt 3 tablespoons ghee or butter in the large non-stick pot over low heat. Arrange the bread on the bottom of the pot. Place 2 spatulas full of rice on top of the bread. Using the back of the spatula or the back of a wooden spoon pack down the rice firmly. Add a layer of green bean mixture on top of the rice. Repeat, alternating rice layer and green bean layer in the shape of a pyramid. Your top layer should be a rice layer. Using the handle of a wooden spoon poke a couple of holes in the rice to allow the steam to escape. Cover and turn up heat to medium-high. Cook for 10 minutes. Turn the heat down to low. Cover the lid with a clean kitchen towel or a couple of layers of paper towel. Place heat diffuser under the pot. Cook for 50 minutes. Remove lid. 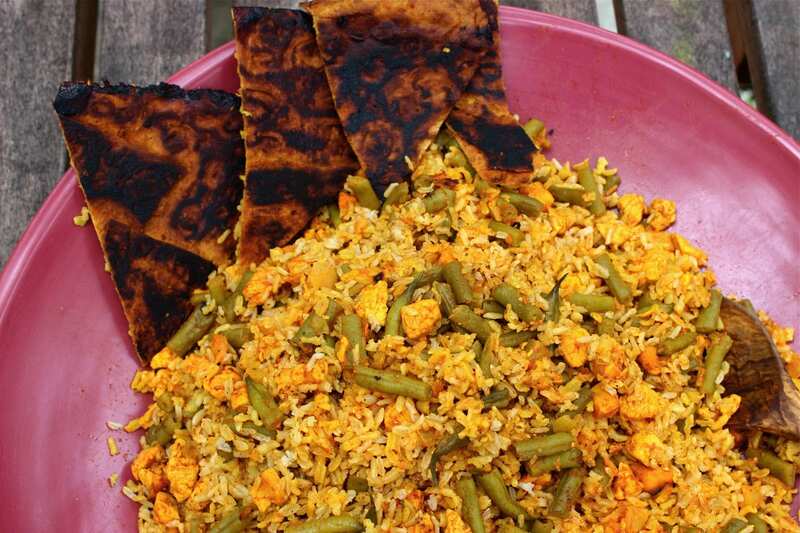 Scatter the green beans rice mixture on a serving platter and gently remove the tahdig and serve on the side. Serve immediately. Remember to serve with a side of mast o khiar!